Congratulations to Linda Bailey! 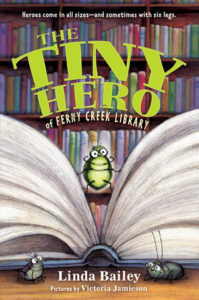 Her book, The Tiny Hero of Ferny Creek Library, has been nominated for a Red Cedar Book Award for 2018-2019. Every year, thousands of children between grades 4 and 7 are invited to read books from the nominated lists of non-fiction and fiction titles and vote for their favourite. Bailey’s protagonist Eddie, a passionate reader who just happens to be a shiny green bug, saves the school library in this funny, heartwarming tale that fans of Flora & Ulysses and Charlotte’s Web will love.